Today, Blogger users using blogger not only as blogging platform to share their story. Blogger also used for news, reviews, tutorial, online shop and other kinds of website to make money. Because of that, the necessity of blogger templates which suitable with those niches of website is increased. The Magazine blogger template is one kind of popular blogger templates needed by people for their news, reviews and magazine blogger site. Here, i share 15+ the best free blogger template with magazine & blog style. I hope you enjoy & love it. Pertamax!! is a Flat and HTML5 Blogger template. Designed by an indonesian called Kang rian. Although it is just blogger template, but it have some cool features and widget. The design is fresh. The navigation is also visitor friendly with top navigation menu. It also have 3 columns footer widget. This template have a red style as original and blue style. Ares is a free responsive magazine blogger template that comply for news, magazine and reviews website. The magazine style is pretty cool and designed for user friendly. It also allow you to change to whatever color you want(Unlimited Color) through blogger template designer. The navigation also very easy and user friendly with sticky top navigation menu bar. Modern Mag is a blogger template with magazine and flat style. 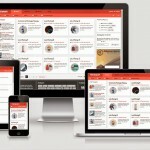 It is a good new solution for news, magazine or personal blogs. Modern Mag Blogger Template is a new magazine style responsive design theme that is idealy beautiful for all niche. It is a perfect choice for newspapers, editorial, multimedia and other blogs. 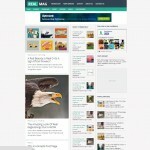 RealMag is a free responsive magazine template with 3 columns. Designed with clean and modern style that oriented to user-experience. This template is ideal magazine template for news, blog and magazine blogger site. It has several popular built-in widgets that means you don’t have to install any external widget by yourself. Manshet is a free blogger template with fully responsive layout and magazine style. It designed for search engine optimization and highly user-friendly. The touch of flat style make it more awesome. It also has many cool features that don’t have in other templates. That is Auto resize thumbnail, unlimited colors, 2 comment systems (Blogger & Facebook), Auto author image, Ads ready and much more. Trendy is a free responsive magazine blogger template with flat and masonry grid style. 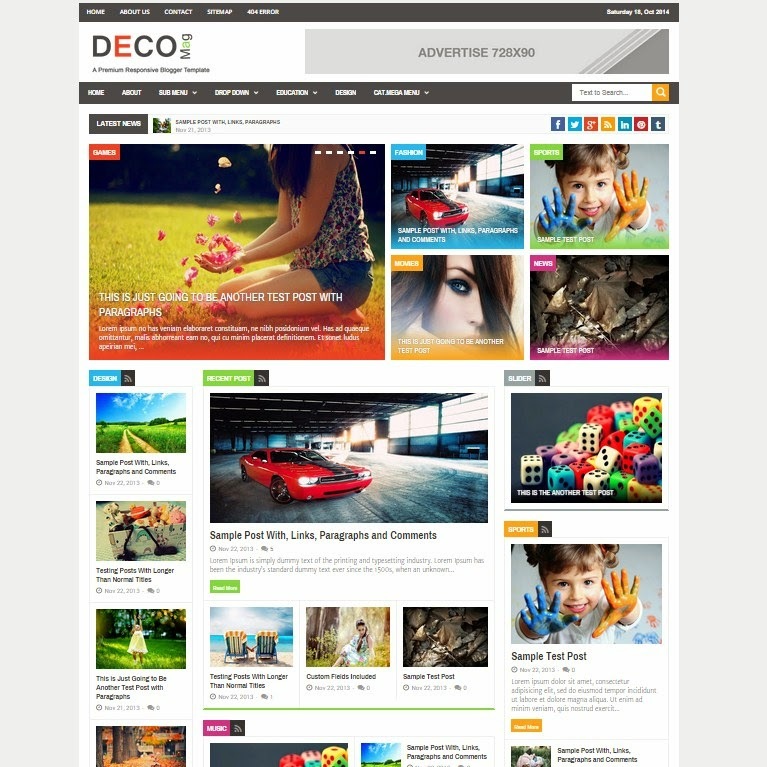 Designed for modern magazine and news website. With a fixed sidebar in left side, trendy become a easy-to-navigate blogger template. Trendy has many features like Auto Resize thumbnail image, custom error 404 page, ads ready between grid, optimized for SEO, and many others. It also has 2 color scheme, red and green. 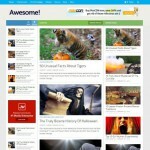 It is a perfect theme for you who have magazine or news blogger site. Blogger Magazine is a news and magazine style blogger template. This blogger template is designed for News/Magazine/Portfolio Blogs. Blogger Magazine, designed with utter care and love, this template is equipped with lot of amazing features this template will perfectly suit your blogger site. 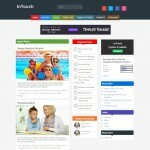 InTouch is a professional blogger template, specifically created for magazine style blogger sites. It will work perfect for them who need a responsive style template and a auto resizable theme. You won’t need to add any extra features in this theme. It already comes loaded with lot of features and widgets in it. All you need to do is simply download this theme and use it in your blogger site. MovieXpose is a unique Entertainment Blogger template which is suitable for any type of cinema, movie promotion, Movie Reviews, blogs and movie communities no matter the size. MovieXpose Template comes with two designs – dark background and light background. It is ads ready, two view mode (List and Grid) width cookies and Rating widget inbuilt. 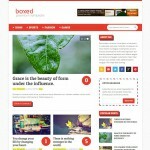 Boxed is a free responsive blogger template designed for magazine, blog and reviews website. Like its name, this template has boxed layout. It is a free premium blogger template created by Soratemplates. It is a great template for great bloggers, writers and designers to help they can share their content to readers easily. 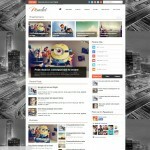 Fency is a free magazine responsive blogger template with flat stlye and boxed layout. Fency is fully compatible with any type of Internet browsers such as IE, Chrome, Firefox, Opera etc. It is built with latest CSS3, HTML5 and jQuery through these combination a design looks awesome when you apply it. This template will make your blog stunning and robust in design. As well as it comes with top notch features. Layla is a magazine blog blogger template that has clean and professional design suitable for any niche. It’s created using the latest HTML5 and CSS3 techniques. With a responsive design it will easily fit on any device screen and it comes in boxed and wide layout! Video Tube Responsive is blogger template for blogger blog which is sharing or serve video contents. The template style is modern and elegant. 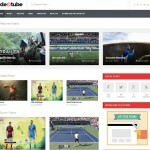 It is perfect for all video related blogs that want to showcase a set of videos in a beautiful way. It supports video thumbnails from Vimeo and Youtube. This theme is free, but if you want premium version that provide more features you can buy premium version through source link above. The templates below are alternative templates if you still not find yet the template you are looking for. These is premium template that i recommend to you to create your magazine blogger sites. 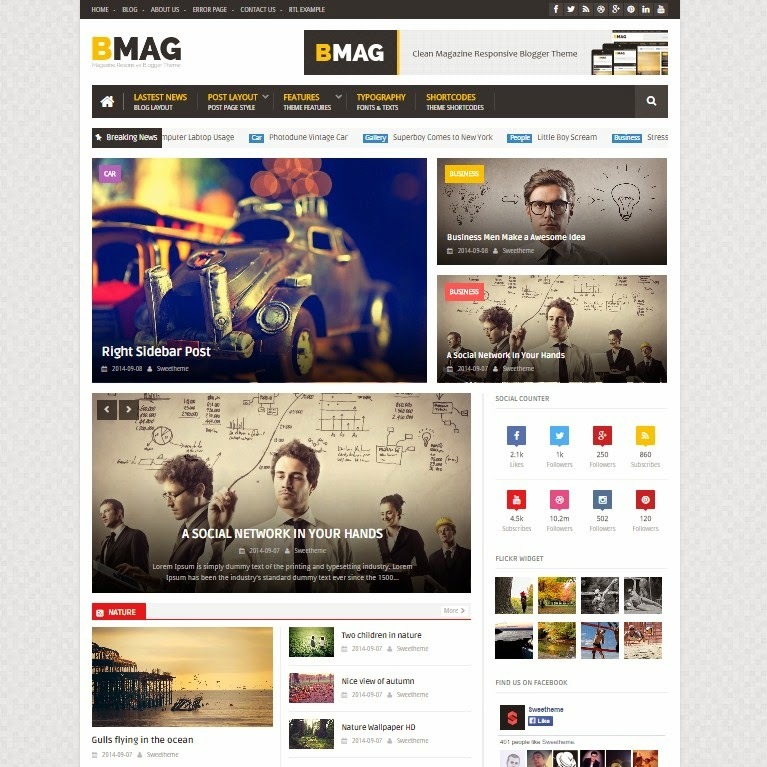 BMAG is a Magazine Responsive Blogger Template, it is clean and compatible with many devices, It’s perfect for creating your magazine or blog using blogspot, no need to coding as it is very customizable template. Thanks for the Templates. I’m so confused which one to use since they are so many, responsive and attractive. Nice List !! !